George Hazlbauer JDPSN (Jiri Hazlbauer) was born in 1975 in Prague. His original occupation is carpentry. Became member of Kwan Um School in 1999. Since then he has helped with construction, maintenance and operation of many Zen Centers around the world. For a time he hold the position of abbot in the american school’s main temple in Providence. 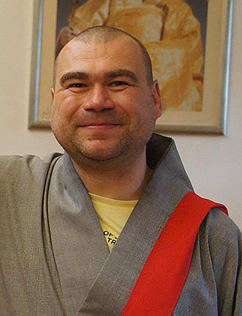 Currently he serves as abbot in Vrazne Zen Center, Czech Republic, where he lives with his wife. In 2016 received Inka (authorization to teach zen by means of koans) from Zen Master Dae Kwang.